So, the unthinkable happened. The tyranny originating from boring old Blighty, now spreads to heartland America. Armed marauder gangs now roam the streets, murdering, pillaging, plundering, violating constitutional rights of people who voted, as Hunter-Killers buzz in the night sky looking for any remnants and pockets of rebel resistance. Millions of liberals, especially celebrities, are now leaving Western shores in a mass exodus just like the Second World War actresses who left Nazi Germany to settle in California. But there’s hope. A small bunch of rebels, armed to the teeth with playdohs, colouring booklets, chocolates and hashtag “#LiterallyHitler” are now determined to take the fight to the Trump camp. The “International Community” is now in talks over whether we should arm the moderate rebels, promote “real liberal democracy” and/or otherwise form a transitional government abroad, possibly headed by Jessica Valenti and Amanda Marcotte. With a cabinet formed of the editorial board of Vox and Guardian. Or at least that’s what you might think if you’re an alien (from outer space, not Mexico) following the emetic social media reaction since Trump’s victory. Of course, none of that is true. Yes, there has been isolated racist incidents, just like there were after Brexit. Racists are there in every society, and they get emboldened by toxic rhetoric, and crimes go up immediately after contested elections. But overall data doesn’t point to any Post Trump “Crime wave”. The system is in place, police are working fine, complaints are being taken, and people are being arrested. Nor are any celebs leaving the country, obviously, which is the single most tragic thing to endure post Trump as I half expected Messrs Schumer, Dunham and Cyrus to share a flat in Iran. In fact, the Quixotic reaction to this election was to see the total meltdown on the left, viciously eating each other up, if not when blaming the Electoral college and patriarchy, or worse, outright rioting. This paranoid criminally sanctimonious hysteria, sort of explains the rise of Trump in the first place. And going by the reaction, the left is hell bent on taking all the wrong lessons from it. As one of my colleagues has pointed out, why do Sarah Kendzior and Matthew Yglesias still have jobs and why do people still listen to them? I don’t have the answers, but it is reasonable to surmise that the appeal of Donald Trump is somehow linked to the cultural hysteria that was produced by his win. Why is it hard to understand Trump’s appeal in heartland America? Listen to the insufferable sanctimony and lib-splaining that’s going on in social media. If it was ever possible to physically smell the tweets, you can almost feel the Chateauneuf du Pape disdain mixed with the fear of the unwashed other. If you close your eyes, you can hear the smug incessant lecturing, in a “umm…eww! Guhrosss!” New York Queen’s accent. Try and visualize and you can see the oversized glasses, purple hair, shaved eyebrows and septum pierced nostrils, “like, totally” judging you for your Neanderthalish table manners and archaic beliefs about holding the door open for women or something equally “demeaning and sexist”. There’s an absurdist inevitability about life, especially when you grow up in a society as competitive as urban India, (as I did) that makes you cynical by nature. But imagine someone in the West, fifty something, who worked all their life, saw through the Cold war, being told that they won the Cold war against Godless communists because of the strength of their conservative social values and bonds, only to see society change radically and their governments bogged down in mindless wars promoting democracy in uninhabitable hellholes, while the social contract between communities became frayed at home, all the while being lectured by Chai Latte sipping 20 something “experts” both in media and real life. This is bizarre and perhaps psychologists are more qualified to explain why this is occurring. But this logical contradiction is now out in the open, where a group of people who are petrified and weak, who claim safe spaces and special treatment on the basis of their inherent weakness, also somehow find the chutzpah to taunt, and mock the other side and try to rule them through the strength of sheer petulance. 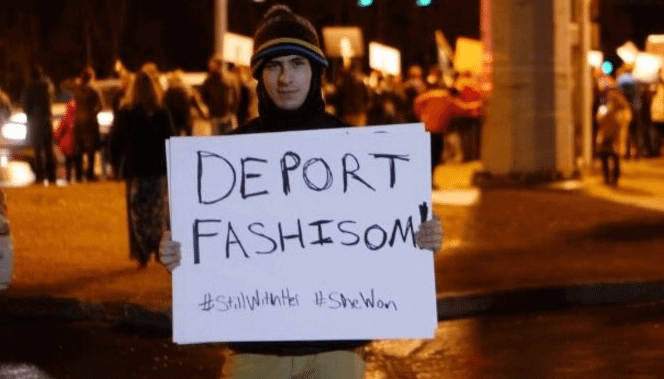 I saw a few post-Trump-victory protest signs on twitter calling bravely to “deport fashisom” hashtag #stillwithher, whatever the hell that means. For a moment, let the spelling as well as the meaningless slogan go, it is a crime against my linguistic sensibilities. Maybe the dude was just trying to show solidarity with the migrants. Does anyone honestly believe that the people who have their University classes cancelled, because they were so devastated that their choice for President lost, would actually lead a revolution against real fascism, with state sponsored, systematic, unchecked brutality? First of all, it is beyond even comprehension that there will be any real fascism, with American Constitutional checks and balances in place, unless of course fascism implies checks on taxpayer paid female birth control, in which case, US just elected Mussolini. The cynic in me is fairly certain that when it comes to fighting actual fascism, should it ever come again, it would be logically incoherent, for those who oppose guns, and those who faint on seeing Trump 2016 written in chalk across Uni Campuses to lead the fray. The result now is a hilarious irony of those same insulated students, who could not imagine from their coddled University world view that the election might be lost because — surprise — people vote differently, and yes, that’s democracy; are now calling for four years of incessant protest. And, guess what, that’s also the democracy they want to export to the Middle East. What they don’t understand is that violence, once it gets out of hand, is not controlled by individuals, but by the movement. From the French Revolution, to the riots and protests in the 1960s which led to Nixon coming to power, history teaches us that violence is often counterproductive, and perhaps not the most clever policy to win hearts and minds. I don’t like Trump. I never did. I am an agnostic, Bengali Brahmin from Calcutta, who worked in New Zealand for half a decade, before moving to UK with a Doctoral scholarship. It is a constitutional impossibility for me to find Trump even remotely interesting. I have written critically about his ideology, incoherent, unfeasible and often contradictory policy proposals, and his almost century old rhetorical technique. But I didn’t take the risk of predicting or betting on his loss, just as I didn’t try to predict Brexit. And it seems pretty clear to me that during contested times, the masses don’t want to understand the prudence of economic benefits, or think rationally, when the survival of a tribe they identify with is perceived to be at risk. Prior to Brexit, my daily interactions with average Britons, from Polish taxi drivers, to British Indian shop owners, to British Chinese restaurant staff, all pointed me towards a different conclusion than the one being propagated in media. People were angry, against interventionism (really, that’s a big thing which is somehow still unreported), and against the resulting uncontrolled immigration, and most of them were obviously not racists. It is frankly absurd to call a British Punjabi shop owner racist, if he opposes immigration from Bulgaria or Eritrea or Ivory Coast, which might or might not cost him his job. It’s not racism, it’s something much more primitive, a sort of Darwinian survivalism. I wasn’t, sadly, in US when the election took place, although going by the post election data, I am fairly certain I would have gotten a similar understanding. That doesn’t change the fact that I dislike Trump. But I can see his appeal in heartland America. It is not class envy (a lot of Trump supporters are well off Whites), it is not about racism (PoC voted for Trump more than they voted for Romney), it is not sexism (women went and voted in droves for Trump), despite what the hyperventilating Slate or Guardian editorial board are trying now to proselytize. The student Marxist group at the university I research at, is manned by well to do middle class students, constantly preaching a “prole revolution”. It is cute, as they won’t recognize a revolution if one were put on a plate in front of them. Of course, they were baffled and devastated both by Brexit and by the rise of Trump. Now, I am no socialist, and I don’t believe in the historical inevitability of class struggle, nor am I anti-elitist per se. (In fact there’s no society without hierarchy, and elites just get replaced in revolutionary societies by another set of elites). But I have read my undergrad philosophy and understand that there’s a simple dialectic that’s constantly at play in society. For us it has been between opposing forces of tribalism and internationalism, interacting with the forces of order and chaos. Human societies, generally are conservative, and they prefer primarily two things, order and rule of law in society, and the perceived safety of one’s own tribe. This has been articulated several times before by Hobbes, Rousseau and Kant, from Burke to Bakunin, between Trotsky and Stalin. There was always going to be an inevitable reactionary backlash against forced internationalist and rapid liberal social restructuring. And this year is as revolutionary as it can get. My humble understanding is that this revolutionary anti-elitism one can see, is not against the rich or upper classes per se, it is against the liberal elites, who just “know better” about immigration, about intervention and about social values. What we have seen is a “burn it all down” revenge vote, against sententious, forced internationalism, aided with near incessant smug lecturing from the cocooned pink haired urban bubbles. Whether it’s good or bad, is for time to decide. But it’s a fact and it might as well be acknowledged. What then about Trump? My guess is as good as yours. It is reasonable to imagine, that he will be dependent on his aides and cabinet to make decisions for him. In any case, the federal structure of the United States does not allow for dictatorship. And Presidents can be impeached. He might simply be a hard right, tax cutting, 80s version of Bush, except maybe with a lot of embarrassing tweets. We unfortunately live in a world of paranoid hysteria where stoic, rational deductions are rare in number. I am old enough to remember “literally Hitler” memes from the Tea Party after Obama’s win in 2012. Some things, I guess, just never change. Presenting the picture of a person who can’t spell “fascism” was extremely unkind. It should be removed at once. Several years of vitriolic and incendiary pejoratives, tone-policing, and shaming tactics, much like the one you’ve put on display here? That is exactly why the election turned out as it did, and is, IN FACT, part of the point being made in this article. Please spend some time in self-reflection. Kathryn I’m offended by your use of ‘should’. Censorship. Dialling back on free speech because it would be unkind? Or perhaps the protester was trying to grab his 15 minutes of fame? It would be more unkind to deprive the protester of their protest. Anyone stop to think that Kathryn’s post is hilarious and is a great example of, what? Satire or irony or some other concept denoting the use of humor? I think that says it all. Thanks for saying it. I think I’m smelling sanctimony, too, but where could it be coming from? Yes, the harassment and vandalism were isolated, a little too much was made of them, but I think you could excuse people for being unnerved by the spray painted swastikas and white supremacist slogans that sprang up overnight. You might also excuse some people for noticing that in five general elections, the Republican candidate won the popular vote once but the presidency three times, which doesn’t quite feel like democracy. And yes, identity politics and political correctness have gotten out of hand and need to be checked. But let me get this straight, in response to the left becoming overzealous in its agenda to change the public discourse regarding marginalized people, an overwhelmingly white portion of the population decided to vote for an openly racist, misogynistic, and violence-inciting demagogue. A thin-skinned narcissist who wants to ban muslims, deport millions of people, and “clean up our inner cities.” A man endorsed and openly admired by authoritarian leaders, white supremacists and crypto-fascists (Well, maybe not-so-crypto now). A man who will appoint Steven Bannon to his cabinet. An exposed and obvious gifter who will, without a doubt, use the presidency to enrich himself, and perhaps won’t do most of the evil he promised, but almost certainly won votes on the off chance that he might. Who is being petulant? Obama has faced the most obstructive and dysfunctional congress since the antebellum. The people taking to the streets now are saying they intend to fight against his very publicly articulated platform of racism, sexism, financial deregulation, and catastrophic environmental policy. Again, who is being petulant? Incidentally, the best indicator of whether someone would vote for Trump was whether they believed Obama was a Muslim. I think we all see what his appeal was. Cute, but not exactly on point. Confusion, hypocrisy and abject moral relativism abound on the left, just as confusion, hypocrisy, and terrifying moral certainty abound on the right. It’s always fun to cherry pick a meme here and a picket sign there, but there is no equation of moral equivalence that balances in Trump’s favor. It’s not even close, not by miles, and it’s truly awful that so many people can’t see it. This is an entertaining read. I enjoyed your prose, thank you!! I do think its important to focus on what this might mean for Republicans too, not to mention the US. If DJT does not appease his base (I mean HOW will he appease his base?) then this has the potential to get a lot uglier than simply an Oompah Loompah with a bouffant. No, I think my guesses are considerably better than yours. At least they have been so far this election season. From here on the ground in America, nothing in the 2016 election was a surprise, not to anyone who was paying attention to anything other than his own bigotries. Trump is by far the best campaigner I’ve ever seen, and here in America I’ve seen my share of campaigns. How he’ll be as President, well, I have my theories, but we’ll see soon enough. The press will continue to fight him and will persist in its lies and distortions, of course, so it may be a bit hard to see how he’s doing from a distance. But here on the front lines, we’ll know. I agree, Trump is a fantastic campaigner – and a very effective troll – and I don’t mean that disparagingly. He operates on a completely different level. Many, perhaps most misunderestimated him bigly – much to their cost. I always thought that there would likely be a shy-Trumper effect, worth 5-8% on the polls, as there had been in the UK Brexit referendum on 23 June 5 months before, and a year before, when the Tory party won the UK general election. It was clear that the goodthink view was anti-Brexit and anti-Trump and people on the wrong side were being called nasty names and subject to the most appalling vitriol. In the UK the state broadcaster – that provides 80%+ of consumed news, were clearly on the lefty side of each issue. The same issues were in play – mass immigration and globalisation, compromised social capital and indifferent, hubris-ridden elites, in a group think filter bubble are actively working against the interests of the bulk of their people. All Republican POTUS candidates since Bush have been labeled as Nazis and Fascists – the hyperbole has lost its sting. Romney and Mc Cain played nice and it did them no favours, now the other side has learned from the cult-Marx – Alinsky playbook, and it is cutting the other way. On both sides of the Atlantic – possibly with the exception of the Teresa May cabinet – the great and good are doubling down, not learning the lessons, not seeing what’s going on. Given that the Republicans have – for the first time since 1928 – won POTUS, the House and the Senate – and given Trumps energy levels. Expect a whirlwind of changes come 20 Jan.
Hopefully he will savagely go after academia, with it cult-Marx group-think and appalling lack of intellectual diversity. Ironically protests are indeed called for, but for a different reason. Gerrymandering, ‘crosscheck’, ‘provisional’ votes and votes not counted, as indicated by, above all, the highly suspect discrepancy between exit polls (a highly reliable instrument) and actual official ‘count’. Differences, not of 0.1 to 0,2%, but of 2 to 5% between exit polls and actual count are unheard of in democracies, unless foul play is involved. And those 2 to 5% clinched it in several ‘swing states’, where the margins were razor-thin. It appears that Clinton did not only win the popular vote, but the Electoral College too -if not for this large scale, multi-faceted election fraud. The election was obviously stolen (nosarcasm). Many writers state it, “of course, there have been a few hate crimes here and there” as a hedge. After all, the narrative that Trump’s election victory has ushered in a wave of such incidents has saturated the media. It’s almost as if it were a prior narrative. But there is no evidence to support any version of it, “wave” or “few”. There is an alarming statistic – now at 900 or so – being spread around the media by the partisan think tank, SPLC. This is not a number of actual hate crimes. They have solicited reports of “hate incidents” through a submission form on their blog. The number they’re peddling is the raw number of clicks on the submission button on their form. The entire story of this “wave of post-election hate crimes” is based on how hard a web form can be spammed. Throughout social media, there has been documentation of “hate incidents”. These mainly appear around college campuses and fall into three categories: unfalsifiable hearsay, unwitnessed and narratively-convenient graffiti, and a dozen or so stories of extraordinary harrassment. In the cases of graffitti, some have been caught out by security cameras as earnest liberals attempting to spread “awareness”. Others were found to have been earnest liberals who believed their statements would be readily understood to be anti-Trump. In the cases of extraordinary harrassment, in every case which includes falsifiable details, these have been revealed to have been deliberately perpetrated frauds. Several of these have resulted in charges of filing false police reports. So, you needn’t hedge. 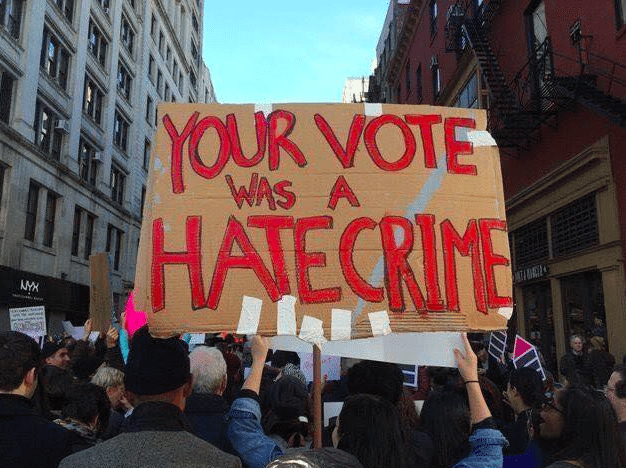 There has been no wave of post-election, pro-Trump hate crimes. It’s a vicious calumny advanced by the party which lost the election ans it’s media.